Is it just Juanita and Jade for backup singers? Yes, for Fall Europe Tour 2018. Juanita and Mahalia take turns for different tours, Jade is always with the band. Love this women - so talented, beautiful voices. And so beautiful. Such a great part of the band, so happy to hear them every time. Some songs can not even imagine without them any more. Helsinki Jäähalli Sept 22, 2018 Full concert playlist. Shot in 4k, audio with a Zoom H1 and Soundman OKM II mics. Taping and editing by yours truly. Additional clips (HD) from other sources used in some songs. N.B. A full concert single file will be uploaded in the near future (finalizing it currently) with all the material re-edited and improved (with new stuff added: introduction, introduction of the band, and intermission before the encores). This was the best JB concert I've been to so far (out of four) and I am happy it came out this nice. And I finally got to meet the man:). Stay tuned. 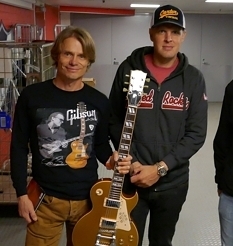 Joe Bonamassa Helsinki Ice Hall September 22, 2018 full concert. All the previously uploaded videos have been re-edited. Included is also the band introductions, not uploaded previously. Bonus material: introduction and editing example. A killer show with a setlist to match.